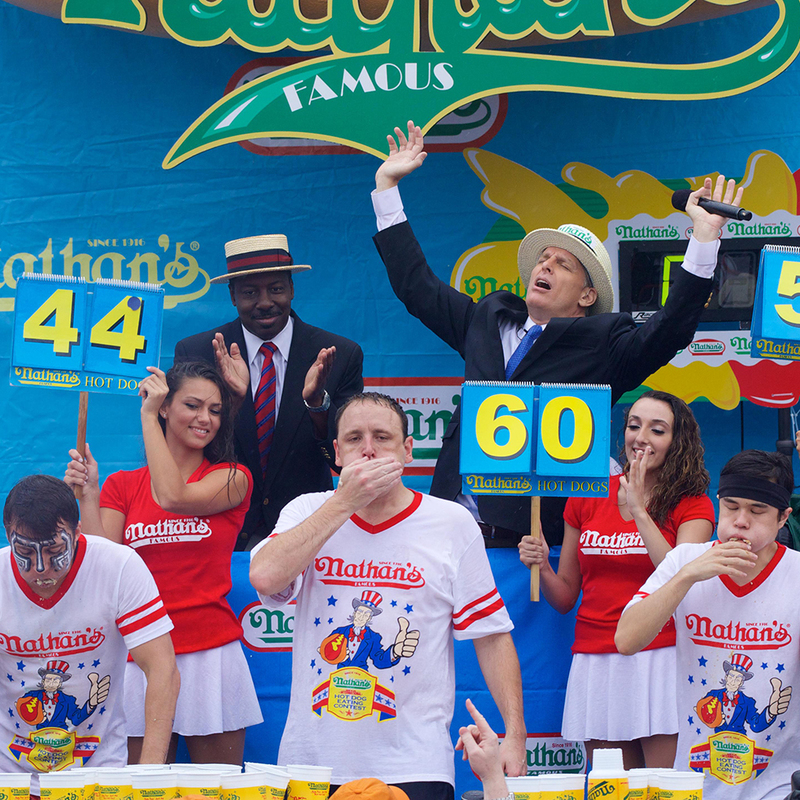 It’s hard to believe that there could be a bigger professional eating event than Nathan’s International Hot Dog Eating Contest – the Fourth of July tradition that encourages grown men and women to down dogs at an alarming rate. But diehard pro-eating fans may already have their sights set on an event set to take place later this year. According to the NY Daily News, eight-time Nathan’s champ Joey Chestnut – one of the biggest names in professional eating (but you knew that) – revealed that he’s planning on having an exclusive one-on-one hot dog competition against probably his biggest rival, Takeru Kobayashi, a six-time hot dog champ, on an undisclosed date later this year. Reigning champ Chestnut will attempt to retain his title again this year against 14 other competitors that include household names like Crazy Legs Conti and Tim “Eater X” Janus, but Kobayashi will once again not be in the lineup. The amazing Japanese eater hasn’t attended the event since 2009 due to contract disputes with Nathan’s. A little history: Kobayashi won the contest every year from 2001 to 2006. Meanwhile, Chestnut has held the title every year since. They competed against each other five times, with Chestnut taking the edge by winning thrice. So a head-to-head matchup would certainly be worth of all the hype – especially due to Kobayashi’s recent absences. According to Chestnut, Nathan’s has given him the go ahead to have the face off later this year and Kobayashi has “agreed to it.” Nathan’s, however, wouldn’t confirm anything, saying, “There have been no commitments made by any parties at this point, and no details are confirmed.” They also teased the possible date as 2016: Nathan’s 100th anniversary. So I guess for now, just be thankful that we have any hot dog eating contests at all!